CBRE today launched the Public Tender sale of a freehold River Valley redevelopment site in prime District 9. The freehold River Valley redevelopment site, Regalia, is located at 2 River Valley Close. 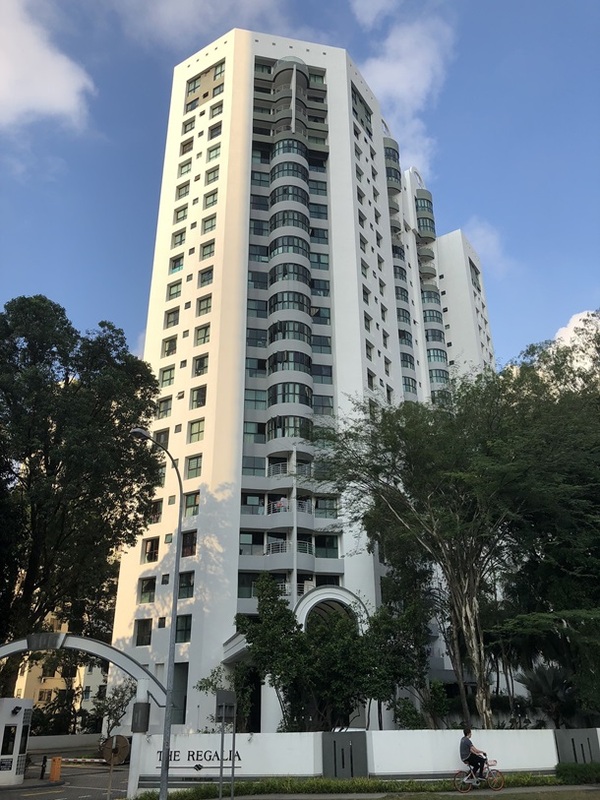 Located in a prestigious residential enclave in the prime District 9, The Regalia sits on a freehold site of approximately 63,371 sq ft and commands prominent corner dual road frontages of approximately 150 meters along River Valley Close and River Valley Road. The development comprises 112 apartments and 4 penthouses. According to the URA Masterplan 2014, the site is zoned “Residential” with a plot ratio of 2.8 with height control of up to 36 storeys. Based on URA’s Gross Floor Area (GFA) verification, the site’s existing GFA is higher at approximately 213,052 sq ft, or equivalent to a plot ratio of approximately 3.36, and no development charge is payable up to the existing GFA. The maximum allowable GFA after taking into account the 10% bonus area on balconies is 234,357 sq ft. The site can potentially be redeveloped into a residential development of 302 units. The guide price of the freehold River Valley redevelopment site, $403 million, reflects a land price of approximately $1,892 per square foot per plot ratio (psf ppr). Taking into consideration the 10% bonus gross floor area for balconies, the land price will be approximately $1,814 psf ppr. The most recent collective sale site transacted in River Valley was Pacific Mansion in March 2018. Located next to The Regalia, Pacific Mansion was sold by CBRE in March 2018 to a tripartite joint venture between Guocoland (Singapore) Pte Ltd, Intrepid Investments Pte Ltd and Hong Realty (Private) Limited for $980 million. This translates to $1,987 psf ppr before balconies. The freehold River Valley redevelopment site is conveniently located just 300 meters from the upcoming Great World MRT Station, on the Thomson-East Coast Line which is one stop from the Orchard Road Interchange MRT Station. Somerset MRT Station and the world-famous Orchard Road are within a five to ten- minute walk away. The tranquility of Fort Canning Park beckons after a 10-15-minute walk, and about the same distance in the other direction is the bustling energy of Robertson Quay with its myriad dining options and amenities. Prime residential developments such as Martin Modern, New Futura, 8 Saint Thomas, RiverGate and Martin Place Residences add to the prestige of the area. For families with school-going children, the freehold River Valley redevelopment site is strategically located just 150 meters from River Valley Primary School, and within 2km to Anglo-Chinese School (Junior), St. Margaret’s Primary School, Alexandra Primary School and Zhangde Primary School. Sammi Lim, CBRE’s Director of Capital Markets said, “The Regalia has a host of attractive attributes such as the freehold tenure, prime River Valley address within close proximity to Orchard Road, the CBD and established schools as well as excellent transport connectivity. Sitting on an elevated site at the highest point along River Valley Close, it offers a regular layout with prominent corner frontages which will appeal to developers. CBRE the exclusive and sole marketing agent for The Regalia said the Public Tender for The Regalia will close at 3pm on 25 September 2018, Tuesday. The public tender of the freehold River Valley redevelopment site is announced weeks after the Government announced new property cooling measures for private residential market. The government acted to cool the residential property market. Additional Buyer’s Stamp Duty (ABSD) rates have been raised for some categories of residential property purchases, and the Loan-to-Value (LTV) limits on residential property purchases have been lowered, all with effect from 6 July 2018. Strata-office and shophouse markets could emerge as the biggest gainers after the new property cooling measures. Are you planning to purchasea freehold River Valley redevelopment site but ensure of funds availability for purchase? Don’t worry because iCompareLoan mortgage broker can set you up on a path that can get you a home loan in a quick and seamless manner. Next articleAre Coding Bootcamps Worth Your Time and Money?